Although nearly a year old, all of the information in this article is still relevant. Testing your smoke and carbon monoxide detector is important; scroll down to find out how. Carbon monoxide safety is a pretty important thing, especially for people who live up north. 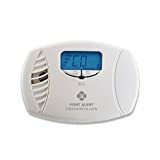 One common question that not enough people know the answer to is “does carbon monoxide rise or fall?” Carbon monoxide is lighter than air so it rises. That means if you do suspect CO poising, you might want to get to lower ground, but it’s probably safest to get outside and call the fire department. Smoke and carbon monoxide are two of the most important devices attached to an all-encompassing home security system. Both devices are life-saving tools, but to get the most of them, they must be working properly. This is where testing comes in. Testing for both smoke and carbon monoxide alarms is rather simple, and staying on top of the devices is not too difficult. With some practice, and setting yourself up with reminders, your alarms will be operating properly at all times. If you are experiencing a first alert 3 chirps every minute, you need to test your alarm. There are two types of testing for smoke alarms that we’ll cover: basic testing and crisis testing. This style of testing occurs when an operator simply clicks on the test button that is present on a smoke detecting device. Pressing this button alone will conduct a test. 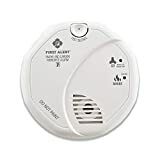 Once the button is pressed, a few seconds will pass before the test starts, but you’ll know the test in process whenever you begin to hear a loud, piercing siren that comes via the smoke detector. A crisis test on an alarm is the form of testing that involves actually using smoke materials to make sure that a system is operating correctly in action, rather than simply knowing that alarm batteries are working. Crisis tests are encouraged not to be done by yourself, because if something out of the ordinary occurs, you’ll want someone near by with a fire extinguisher to put out the flames. A crisis test can be conducted by simply lighting a candle, incense stick, or other material for burning. When a steady smoke stream for this material is achieved, hold it underneath the smoke detector unit, about 12 to 18 inches below. Make sure not to get too close to the alarm, because you’ll risk damaging the casing on the smoke detector, the actual unit itself, and the delicate materials housed inside of the detector. Make sure the alarm goes off in every room if you have an interconnected system and follow up with turning it off. Aerosol products are great for tests, but make sure the instructions of the aerosol manufacture are followed. The spray should be aimed so it enters the alarm sensor area. Don’t spray the aerosol at the holes that are on the cover of the alarm, because this is where the sound emits. The alarm senses smoke through the opening around the perimeter. The way to test is by holding the aerosol can two feet away from the alarm, ensuring that it is parallel to the wall or ceiling. With this process the test spray is allowed to travel along walls or ceilings to ensure it enters the openings in the perimeter of alarms. Remember, spraying in excess at close range of an alarm might affect its sensitivity permanently. It isn’t recommended to ignite combustible materials to test alarms. This could cause an accident or fire. A lower risk option is to light several matches to make sure the alarm is registering smoke particles. UL rated cans of smoke can also be purchased to test devices. Testing a carbon monoxide detector is very similar to testing a smoke alarm. Before testing, you’ll want to alert your home security company of the test and place your system on test mode so that the device does not cause a false alarm. To test a carbon monoxide detector, hold down the “test” button until you hear two beeps sound off. Once you hear these beeps, release your finger off of the test button. Recreate this event, but this time hold down the test button until you hear four beeps. If the four beeps are heard, you know that a signal was sent to your monitoring station. After 10-15 minutes the CO alarm will return from test mode back to its original setting. If for some reason the device doesn’t return to its original setting, you’ll need to perform a power cycle. With interconnected alarms, make sure they are all emitting sound together. 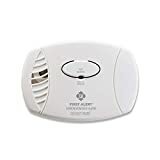 When testing, include people in other rooms of the house to make sure alarms in every room are working, and to make sure that you can hear alarms from every room. If you fail to hear an audible noise, it means batteries need to be replaced. Don’t allow dust or debris to settle into devices or they’ll work improperly. If the smoke detector is hardwired to a monitored home security system, make sure to alert your company before going through with the alarm test, so they know a test is taking place and they don’t send responders to the home. Even if unit’s light are on signalling they have power, still test the devices. Wear ear protection when standing next to alarms when testing. They are very loud. If you just moved into a new house and the house is equipped with smoke alarms, you can check the dates on the devices by looking on the back of them. They will usually display a date of manufacture and you can calculate the device’s age. If you can’t find the age on the device, replace the unit. Alarms are just sources to alert you of danger. They won’t themselves save you. You still have to create an action plan and respond to an emergency by escaping a home. Never decorate any part of alarms. No paint, no stickers, and no using them to hang household items. Doing any of these will impair function. Both smoke and carbon monoxide alarms should be tested once a month at minimum, but once a week is recommended. Batteries should be replaced twice a year when clocks are changed for savings times. Most smoke and CO alarm are said to last ten years, but we suggest beginning to take a look at replacement at the five-to-seven year mark to see how they are performing. If you purchased an older home and don’t know the age of your smoke and carbon units, replace them entirely.